What are Your Food Triggers? Let’s talk about triggers. A recent study that looked at people’s responses to candy bowls in an office showed that they ate a lot more candy if it was in a clear, glass bowl with easy access compared to when they couldn’t see the candy or if they had to open the lid of the bowl. What does this tell us? Besides hunger, a number of things can trigger you to eat. For many women, watching television and eating go hand in hand; others catch themselves snacking mindlessly while they talk on the phone or cook dinner, and some people start craving a cheeseburger every time they drive by a fast-food restaurant. These are examples of how your environment can influence the decisions you make about food and derail you from your plan to eat healthily. You eat while watching television: Make a commitment to eat only at the table. Turn off the TV and don’t engage in other activities, such as reading or talking on the phone, while eating. You eat while preparing dinner: Chew gum while you cook or cut up raw vegetables to snack on while you prepare the meal. You have second helpings at dinner, even though you’re full: Don’t keep serving dishes on the table. Put a portion of food on your plate and immediately put leftovers away. You’re tempted by the coffee shop you pass on the way to work: Take a different route to work. Make your own coffee at home so you won’t be tempted to stop. The vending machines at work are full of alluring snack foods: Avoid walking past the vending machines, if possible. Always have healthy snacks in your desk drawer and keep your spare change at home. Put a bowl of apples on the kitchen counter. Replace high-calorie snacks with low-fat versions. 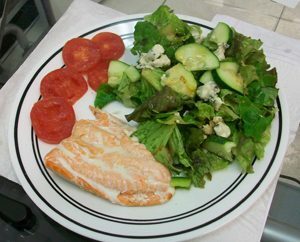 Use a smaller plate or a segmented plate for portion control. Keep a bottle of water on your desk at work. Pack your lunch and have healthy snacks available in the office. Maybe you’ve heard the saying “failing to plan is planning to fail.” It seems there’s a bit of truth to that when it comes to managing your weight. Many people have intentions to eat better and exercise more, but they aren’t successful because they don’t have healthy foods available and can’t find their treadmill under the pile of laundry. Healthy habits don’t happen by accident. They start with planning and preparation. It can be a bit time consuming, but as time goes on and as healthy eating and physical activity become habits, planning will take less time and effort. Create a weekly menu. Decide in advance what meals you’re going to eat throughout the week. Write down your plan and post it on your refrigerator. Make a grocery list. Use your weekly menu to create a shopping list. Include healthy staples such as fruits and vegetables. Go shopping once a week. Purchase foods to keep your home and office stocked with healthy options. Stick to your grocery list while shopping. Eat breakfast. Get up a few minutes earlier each morning to enjoy a healthy breakfast to start your day out right. Pack your lunch. Purchase an insulated lunch bag or cooler, and try packing your lunch at night to save time in the morning. Be sure to include healthy snacks too. Schedule physical activity. Make exercise a priority by scheduling it on your calendar like you would any other appointment. Pack your gym bag. Get everything you’ll need to exercise ready at night, and put your gym bag in your car so you don’t forget it.